Combine a central ‘go-to’ file repository with powerful document management functionality for fast, simple and secure file sharing. Easily assign tasks and priorities, to individuals or groups. A transparent environment that manages your team’s activity, their engagement and progress. Connect your distributed team in a user-friendly online workspace. Organise communication, encourage collaboration and improve teamwork. Build a hub that’s inexpensive, quick to implement that actually encourages social interaction. It’s ideal for groups that want to stay informed and increase productivity. Customise and brand portals that provide an efficient way to collaborate, by securely storing and sharing information outside of your organisation's firewall. Create a culture of idea-sharing and innovation by giving teams the power to create, share and search content, all manged from a central location. Effortlessly broadcast information to large and dispersed groups of people, simplify their collaboration and organise their group feedback. Invite your members and affiliates to private interest groups, which help build strong and engaging communities that inspire interaction. The same powerful collaborative functionality that SharePoint has but requires no training, is simple to set-up, quick to deploy and users love it! 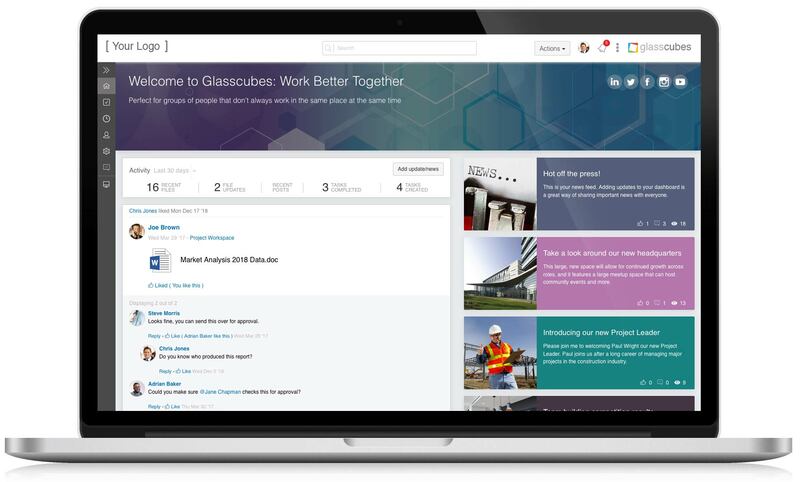 We pride ourselves on how easy and intuitive Glasscubes is to use. Our support is often highlighted by customers as among the very best that they have experienced. This is because every Glasscubes customer receives the highest level of personal, professional support, with a response time that is unmatched elsewhere in the industry. Glasscubes uses SSL encryption to ensure your data is secure. We are Government-approved and accredited by UKAS with the ISO/IEC 27001 Information Security Management Systems certification and IASME Consortium with the Cyber Essentials certification.